WhatsApp backup has always been an easy process, but now WhatsApp is aiming to make it even easier. This messenger app is quite different from others especially in terms of backing up its users’ chat history. WhatsApp doesn’t have its own cloud storage, instead uses the cloud storage from external companies. 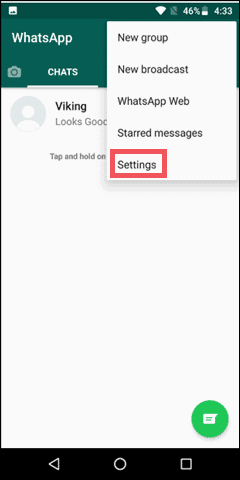 Android users are required to back up their chats in Google Drive. Apple users do their WhatsApp back up in iCloud. When this was being done on Android devices, one had to compromise on their Google Drive storage as WhatsApp backup took up some space. The good news is that now this will not be counted in the Google Drive space. As Google now provides 15GB of free cloud storage to all its users. Until the recent update, the WhatsApp backup data was in Google Drive and was counted as a part of its storage space. But now you can have your WhatsApp backup absolutely free on Google Drive. This is good news as all your important messages can now be saved. This is especially useful if you happen to lose or damage your phone. If you have not updated your WhatsApp backup for more than one year, chances are that your data has been wiped out from Google Drive with the recent November 12, 2018 update. Even if you had access to the automatic backup setting, as a user, one would have had to refresh the existing backup, 30th October 2018. Your backup, like your chat history, disappearing altogether would also be a problem. This is true if you have not updated your WhatsApp for more than one year. This is applicable for both Android as well as iOS users. With this forewarning, it is now advisable to take all your WhatsApp backup, so that any future loss is avoided. We highly recommend that you use Wi-Fi while taking the WhatsApp backup as it may contain large files and deplete your mobile service plan. Given below are the simple steps that you need to follow. Note: The screenshots used are from an Android phone. 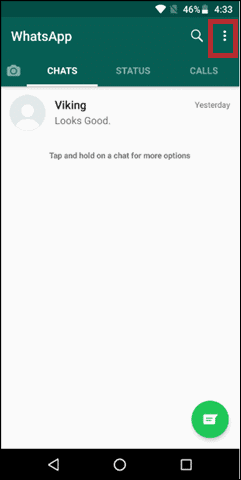 Now, tap on Chats. 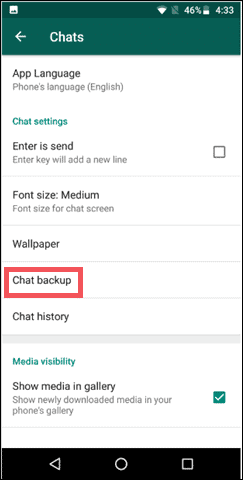 Go to Chat backup option. If you want a WhatsApp backup, of all your recent chats, then click on Backup. 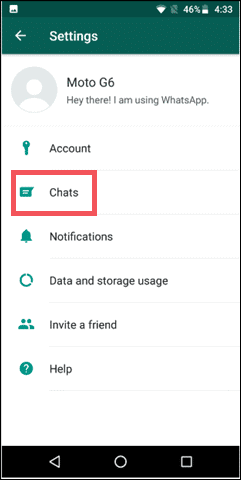 Now you can customize the Google Drive Settings while taking a backup of your chats. 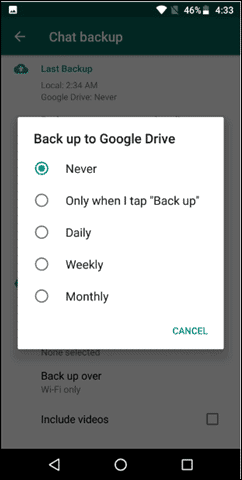 Suppose you need to set the frequency, of how often you want to do the backup done automatically or manually, click on Back up to Google Drive. You can set it as Daily, Weekly, Monthly, Never or Only when I tap “Back up”. You can also opt out if from Include videos options if you don’t want to take the backup of videos you sent or received in all your WhatsApp chats. 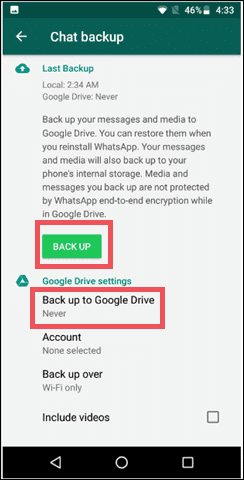 Please do remember that all the media and messages that you take as WhatsApp backup in Google Drive will not be protected via WhatsApp end-to-end encryption. Also Note: If you are worried that your Android backup data will be in a just a cluster then there is good news. The new feature ‘Priority in Drive’ will help you organize and manage your WhatsApp backup data online. You can now add different labels to each folder. Now, feel free to take a back up of as much WhatsApp backup data as you want. This process is easy to customize but now the best part is that it will no longer consume your Google Drive storage space.